Louis Hector Berlioz (December 11, 1803 – March 8, 1869) was a French Romantic composer best known for the Symphonie fantastique, first performed in 1830, and for his Grande Messe des Morts (Requiem) of 1837, with its tremendous orchestral resources. Born into a well-educated family, he was expected to follow in his father's footsteps and practice medicine or, alternatively, law, but he dared to disrespect the wishes of his family in order to pursue music. He studied music in Paris and also took private lessons from teachers who encouraged his 'misfit' genius. Both of his marriages were unhappy, the first consummated after years of infatuation and rejection, only to grow into alienation and separation; the second equally miserable. He had one son, Louis, with his first wife Harriet. The dramatic events of his life were mirrored in his music, which also mirrored the prevalent moods of the age of Romanticism. 2 "Beethoven is dead, and Berlioz alone can revive him"
Berlioz is credited for his large-scale and skillful employment of Romantic features in music, such as orchestral innovations, employment of new instruments and their combination, dramatic brilliance, and depiction of local color. His native France did not recognize his genius and is still hesitant in this respect, but Western European audiences adored his performances. Perhaps because of this he was better known as a conductor than as a composer. Fortunately for him, his father took pity and supported him for a limited time period. This enabled Berlioz to take private lessons from the director of the Chapel Royal, Le Sueur, a specialist in vocal music, who proved to be Hector’s much needed moral and financial support, and from the Czech colleague of Beethoven, Antonin Reicha, who endorsed innovation. His orchestration skills were self-taught, accomplished by following the score while watching opera performances. He followed the scores so religiously that he would protest loudly whenever there was a change in orchestration, much to the dismay of the audience. He then attended Conservatoire de Paris, studying opera and composition. In an effort to fund his studies, he competed for Prix de Rome, a musical award established by the French government to sponsor promising young French artists (under 30 years of age) in their studies for five years. This prize was awarded not only in music but also in painting, architecture, sculpture, and engraving. The winner received 3,000 francs (approximately 2,500 USDollars) for each year and was required to pledge to spend the first two years at the French Academy in Rome and the third year in Germany. Claude Debussy was one of the winners. However, the Prix de Rome was eluding the young Berlioz, which compelled his father to the termination of the allowance. With the loss of his parents' financial support, Berlioz was forced to look for a job, and began giving flute and guitar lessons. In addition to this, he wrote articles. Early on he became identified with the French Romantic movement and befriended writers such as Alexandre Dumas, Victor Hugo, and Honoré de Balzac. Theophile Gautier wrote, "Hector Berlioz seems to me to form with Hugo and Delacroix the Trinity of Romantic Art." Berlioz finally succeeded in winning the Prix de Rome in 1830. Berlioz is said to have been innately romantic, experiencing emotions deeply from early childhood. This manifested itself in his weeping at passages of Virgil as a child, and later in his love affairs. At the age of 23, his initially unrequited love for the Irish Shakespearean actress Harriet Constance Smithson became the inspiration for his Symphonie fantastique. Harriet was described as a mediocre actress who relied on overacting to disguise a weak voice and lack of skill. However, the fascinating characters of her plays caused her audiences to become entranced with her; the king even sent her a gift. Berlioz fell in love with her at the first sight during one of her performances. Miss Smithson would not respond to his passes and would not come to the concerts of his works. He wrote her overly passionate letters, which only prompted her to refuse his advances. However, the symphony which these emotions are said to inspire was received very well and considered startling and vivid. The autobiographic nature of this piece of program music met with sensation at that time, merely three years after Beethoven's death. When Harriet’s career and famed looks took a turn for the worse, she finally attended a performance of the Symphonie fantastique and quickly recognized in it the content of his passionate letters to her. This was in 1833, Berlioz was back in Paris from his two years’ studies in Rome, and marriage to Smithson soon followed. However, within several years, the relationship degraded, a fact partly attributed to her possessiveness and their severe personality and temperament clashes. In 1842 Berlioz became romantically involved with a second-rate mezzo-soprano Marie Recio, who was described as 'a bossy shrew'  and insisted on singing in his concerts. Unhappy with the way their romance was evolving, Berlioz made an attempt to return to Harriet a year later, but by that time she had been reduced to an overweight alcoholic who neglected her looks. Divorce was illegal at that time but separation was acceptable, and Hector and Harriet chose this option in 1844. They had a son together, Louis. Berlioz married Marie only after Harriet's death in 1854. Berlioz traveled throughout much of the 1840s and 1850s with Marie, conducting operas and symphonic music, both his own and those composed by others. Germany in particular welcomed him; Prague and England also embraced his talent. In Vienna, pies were named after him and jewelry containing his cameo was in fashion. On his tours he met other leading composers of the age, among them Schumann, Mendelssohn, Wagner, Brahms, and Liszt (who promoted his works). During his lifetime, he was more famous as a conductor than a composer, and since he was not well received in France, he performed in those parts of the world where he did receive admiration. The climax of his career came in Moscow, where Tchaikovsky proposed a toast to him. From 1852 until his death he held the position of librarian with the Paris Conservatory. In 1856 he was elected member of the French Institut, during which time he developed the symptoms of intestinal neuralgia. This caused severe weight loss, and led to bitter emotions and manner. In 1866, his son Louis died of fever in Havana. The death of his beloved son, augmented by his unhappy second marriage and the nervous ailment, sentenced Berlioz to gloomy final years. His mother-in-law cared for him when he became bedridden and suffered from intense pain. He died at the age of 65, with his last words reportedly being; "Enfin, on va jouer ma musique"—"At last, they will now play my music." He is buried in the Cimetiere de Montmartre alongside his two wives. "Beethoven is dead, and Berlioz alone can revive him"
Thus spoke the virtuoso violinist and composer Niccolò Paganini after hearing Berlioz's Harold in Italy. Originally, Paganini commissioned Berlioz to compose a viola concerto, intending to premiere it as soloist. This became the symphony for viola and orchestra Harold in Italy. Paganini eventually did not premiere the piece, but Berlioz's memoirs recount that on hearing it, he knelt before Berlioz and declared his genius, and the next day offered him 20,000 francs. With this money, Berlioz was able to halt his work as a critic and focus on writing the dramatic symphony Roméo et Juliette for voices, chorus and orchestra. Berlioz himself believed that he was Beethoven's successor because he too purposely broke down the barriers of symphonic music to allow for greater flexibility, was subjective, and strove to make music the voice of human and poetic experience. The performance of the Beethoven's Symphony No. 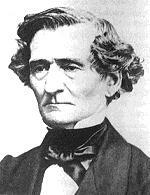 3 "Eroica" in Paris seems to have been a turning point for Berlioz' compositions. However, while Beethoven’s breach of traditional rules of structure and content as well as his nonconformist behavior ushered in Romanticism, Berlioz became a symbol, a quintessential composer of Romanticism, described as music's Delacroix or Hugo. Next to Beethoven, Berlioz showed deep reverence for the works of Gluck, Mozart, Étienne Méhul, Carl Maria von Weber and Gaspare Spontini, and thought highly of Rossini, Meyerbeer and Verdi. Curiously, the adventures in chromaticism of his prominent contemporaries and associates Frederic Chopin and Richard Wagner seemed to have little effect on his style. Politics during the period of Romanticism was marked by the struggle for freedom; the school of painting, exemplified by J.M.W. Turner replaced the Classicism’s scanty use of color with its indulgence. Opera cultivated lyrical color and contrast as well as the exotic and oriental. Melancholy on one hand and horror on the other were frequent fascinations with the composers of that time. Religion was also celebrated, albeit not in the orthodox ways of Liszt and Schumann. Overall, expressiveness and emotion were of paramount importance, which is why love dominated the themes, although it was often expressed as 'total dedication of a great soul to another',  rather than sexual love. Berlioz’ music was essentially an extension of his life — an overabundance of passion, intensity, turbulence, and neuroticism, and these phenomena coincided with virtually all elements of Romanticism, which sought to replace the simplicity, calm, and conformity of Classicism: the picturesqueness and sense of local and historical color in Benvenuto Cellini and Harold in Italy, Byron’s school in the "Witches' Sabbath," and the melancholy espoused by most French Romantic poets, in Symphonie fantastique. The lyrical quality, however, is more conspicuous in Liszt, as Berlioz's forte was drama; he treated lyric as secondary. Romeo et Juliette's poetic eloquence makes it an archetypal work of Romanticism. With such an intense internal life, Berlioz would often find himself in a world where there were no boundaries between reality and fantasy. Music was the vehicle of his feelings; it recorded the events of his life and love through the color of musical instruments that he employed. Moreover, he introduced instruments not found in traditional orchestras and increased the size of the orchestra and the combinations of instruments. His achievements in orchestration alone would suffice to guarantee him a position of genius, but he was also a genius of invention. Wagner, Liszt, Strauss, and Debussy would take inspiration from his experimental treatment of the orchestra; Debussy would employ a gargantuan orchestra. Music of Romanticism was linked with other arts, particularly literature, where an easy access to novels and poetry facilitated the composers' contact with the spirit of the age. However, since composers were mostly employed by courts, their adoption of Romantic aspirations was not unbridled. Berlioz stood out among this crowd; nobody adopted the elements of Romanticism as masterfully as he did. He would look for inspiration in works of literature, which he would transform to reflect his own feelings through those of the protagonists. Harold, the poet in Symphonie fantastique, as well as other characters, were essentially Berlioz's alter ego. He would write detailed programs to accompany his works. He also wrote musical reviews and supported himself in this fashion for many years. He had a bold, vigorous style, at times imperious and sarcastic. Evenings With the Orchestra (1852) is a scathing satire of provincial musical life in nineteenth century France. His Memoirs (1870) paints a magisterial portrait of the Romantic era seen through the eyes of one of the characters. The pedagogic work The Treatise on Modern Instrumentation and Orchestration established Berlioz' reputation as a master of orchestration. It was closely studied by Gustav Mahler and Strauss and served as a stepping stone for a subsequent textbook by Nikolai Rimsky-Korsakov, who as a music student attended the concerts Berlioz conducted in Moscow and St. Petersburg. "I belong to a nation which has ceased to be interested in the nobler manifestations of intelligence, and whose only deity is the golden calf. The Parisians have become a barbarous people." Ignored through much of the nineteenth century, the music of Berlioz enjoyed a revival during the 1960s and 1970s, due in large part to the efforts of British conductor Colin Davis, who recorded his entire oeuvre, bringing to light a number of Berlioz's lesser-known works. Davis's recording of Les Troyens was the first near-complete recording of that work. Berlioz never saw it staged in its entirety during his life; now it is part of the international repertoire, if still something of a rarity. 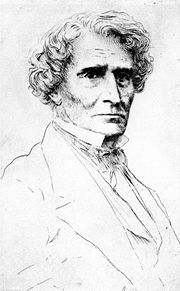 In 2003, the bicentenary of Berlioz's birth, a proposal was made to transfer his remains to the Panthéon, but it was blocked by President Jacques Chirac in a political dispute over Berlioz's worthiness as a symbol of the Republic, since Berlioz, who regularly met kings and princes, had dismissed the events of the Revolution of 1848 as the "odious and stupid republic." Also, he had wished to remain buried close to his wife. It is obvious that in the land of his birth, Berlioz is still a neglected prophet. The music of Hector Berlioz is cited as extremely influential in the development of the symphonic form, instrumentation, and the depiction of programmatic ideas — features central to Romanticism. He was considered extremely modern for his day, and together with Wagner and Liszt, he is sometimes characterized as ‘The great trinity of progressive 19th century Romanticism’. Liszt was his enthusiastic supporter and performer, and Wagner, after first expressing great reservations about Berlioz, wrote to Liszt saying: "We, Liszt, Berlioz and Wagner, are three equals, but we must take care not to say so to him." (source not cited) As Wagner implied, Berlioz was indifferent to the 'Music of the Future', although he had an impact on both Liszt and Wagner, along with other forward looking composers whose works he did not care for. His innovations in music were daring, bordering on iconoclasm, and often foreshadowed new styles and techniques, such as Symphonie fantastique, which is the precursor of List's tone poem. Like Debussy, who introduced non-Western elements into Western music, Berlioz freed rhythm from its fixed structure of two, four, and eight beats and introduced unprecedented irregular patterns and effects. This was naturally viewed as unorthodox and eccentric, while it actually tapped into new sources of dynamism. His idiomatic and systematic treatment of the orchestra as a conductor also elicited scores of followers, particularly among the French school of conducting, and this trend persists to this day, exemplified by Pierre Monteux, Pierre Boulez, and the French Canadian Charles Dutoit. Symphonie fantastique (1830) — inspired in part by Thomas de Quincey's Confessions of an English Opium-Eater. Written when he was 27 years old and infatuated with Harriet Smithson, who would not at that time acknowledge him. It opened up a new notion of sound with its detailed and literal program and the fantasy and macabre and the psychological, with its vast size of the orchestra and the turbulence of emotion, departing from the language of Haydn, Mozart, Beethoven, and Schubert. The heroine turned into a courtesan on his hearing of disturbing news of Smithson. Le corsaire (The Corsair), overture for orchestra, op. 21 (1831). Overture to Benvenuto Cellini, for orchestra, op. 23 (1837) — inspired by Cellini's autobiography. Harold en Italie (Harold in Italy), symphony for orchestra with solo viola, op. 16 — based on Byron's Childe Harold. Grand Messe des morts (Requiem), for solo voices, chorus, and orchestra, op. 5 (1837). Romeo et Juliette, dramatic symphony for solo voices, chorus, and orchestra, op. 17 (1839) — based on Shakespeare's Romeo and Juliet. Le carnaval Romain (Roman Carnival Overture), for orchestra, op. 9 (1844). La damnation de Faust (The Damnation of Faust), dramatic legend for solo voices, chorus, and orchestra, op. 24 (1846) — inspired by Goethe's Faust. Te Deum, for chorus and orchestra, op. 22 (1849). L'enfance du Christ (The Childhood of Christ), oratorio for solo voices, chorus, and orchestra, op. 25 (1854). Les Troyens (The Trojans), opera in five acts (1859) — inspired by Virgil's epic poem The Aeneid. Beatrice et Benedict, comic opera in two acts, with text by the composer — based on Shakespeare's Much Ado About Nothing (1862). Les nuits d'été — a cycle of songs originally for voice and piano, later with orchestral accompaniment. Berlioz, Hector. Mémoires. Flammarion, first edition, 1991. ISBN 2082125394. Cairns, David (ed). The memoirs of Hector Berlioz. Everyman Publishers, second revised edition, 2002. ISBN 185715231X. Ewen, David (Ed). The Complete Book of Classical Music. London: Hale, 1966. ISBN 0709038658. Faul, Michel. Louis Jullien, musique,spectacle et folie au XIXe siècle. Editions Atlantica. 2006. ISBN 2351650387. Kamien, Roger. Music: An Appreciation. Mcgraw-Hill College, 3rd edition, 1997. ISBN 007-0365210. Steen, Michael. The Lives and Times of the Great Composers. Oxford University Press, USA, 2003. ISBN 0195222180. The Hector Berlioz Website, Monir Tayeb and Michel Austin. "Berlioz's Gravesite" Find a Grave Website. "Berlioz, Hector" Intratext Digital Library. This page was last modified on 12 December 2017, at 17:39.